If you are thinking about taking a tour on one of Boston’s Duck Boats you may have reservations about some of the recent press. Historically though the Duck Boats have been a pretty safe way to tour the both the streets of Boston and the Charles River. Boston Duck Tours has been operating in the Boston area for 16 years and defended their safety record on NECN after the unfortunate accident in Philadelphia. Strangely enough in the weeks that have followed 2 accidents involving duck boats occurred on the streets of Boston. One involved a small rented car that allegedly jumped into the path of a moving Duck Boat which let’s face it is not really advised. As a driver you try to avoid them and give them room as you would any larger vehicle like a bus or truck that may not always we able to see you. The other accident did appear to be caused by either a mechanical failure of some kind or operator error. The injuries thankfully were not serious and many credited the driver for minimizing the possible damage. My family and I have ridden on the Boston Duck Boats. They actually brought me on a duck tour on Mother’s Day a couple of years ago. I will say that I did not feel any sense of danger while on the ride. The Boston Duck Tours ride on the Charles River and the type of boat traffic there is not like the barge that hit the one in Philadelphia. I am including the video from NECN that also notes that the other duck boat tour Super Duck Tours which does enter Boston Harbor uses larger boats designed for the rougher ocean waters. 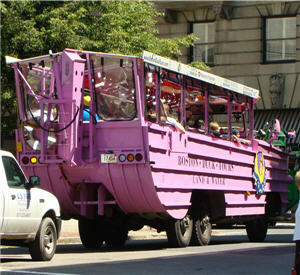 Duck boat tours actually started out here in Massachusetts and they continue to be a big tourist attraction. If you decide to ride either one be sure to pay attention to safety instructions. Like planes I have noticed that not everyone pays attention when they should. Though it is highly unlikely that you will need to remember them it will definitely ease your mind.